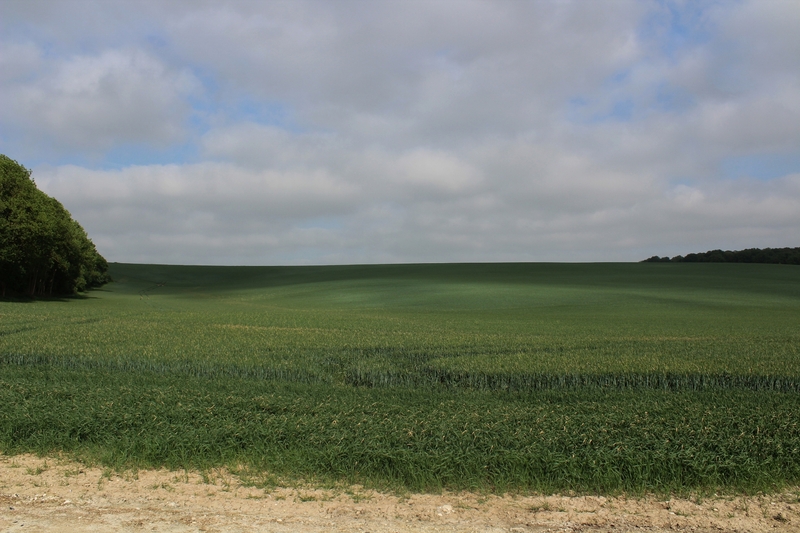 Just a few photos of rolling hills this post. And two stories, one of defence, and one of attack. 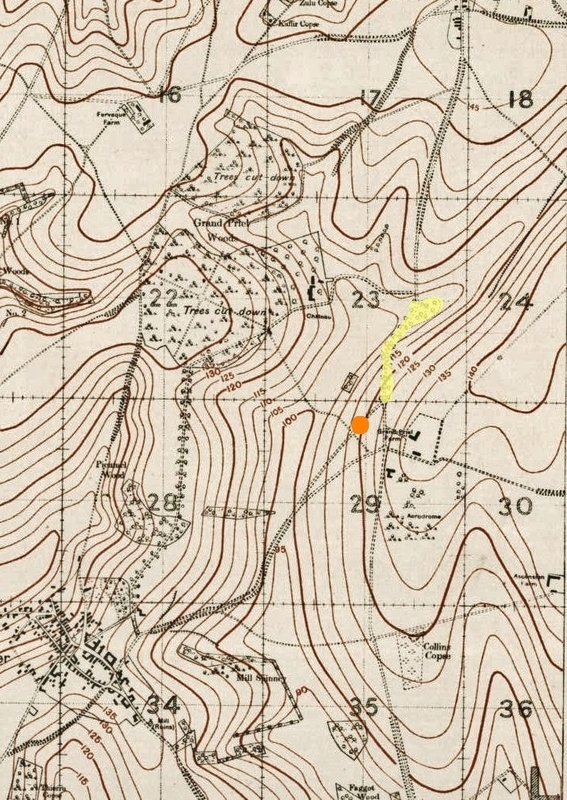 Map showing our current position, marked in orange, with Shepherd’s Copse, the purported site of Sayer’s stand, outlined in yellow. No signs of war on this map, except the ‘Trees cut down’ you can see in two places. 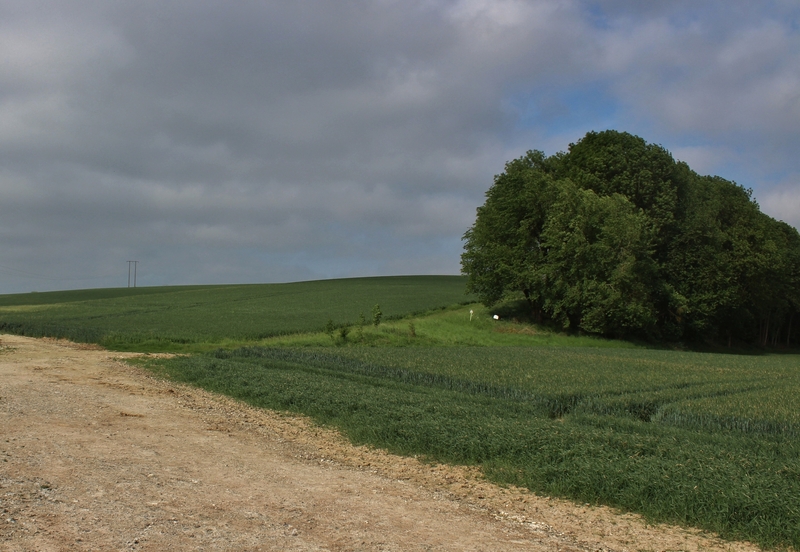 The vestiges of Shepherd’s Copse today – the small line of trees furthest to the left in this shot – and Lance Corporal John Sayer (inset). …with outposts on the hills to the right of the valley, as this close-up shows, and the fortified village of Le Verguier in the bottom left hand corner. It’s interesting to note the names of the outposts in square 24, east of Shepherd’s Copse; Goat, Sheep, Lamb, Ewe, Bull & Cow. And behind these posts, and I don’t think the name is co-incidental, Shepherd Post, serving all six outposts, I would suggest, much like the shepherd and his flock. 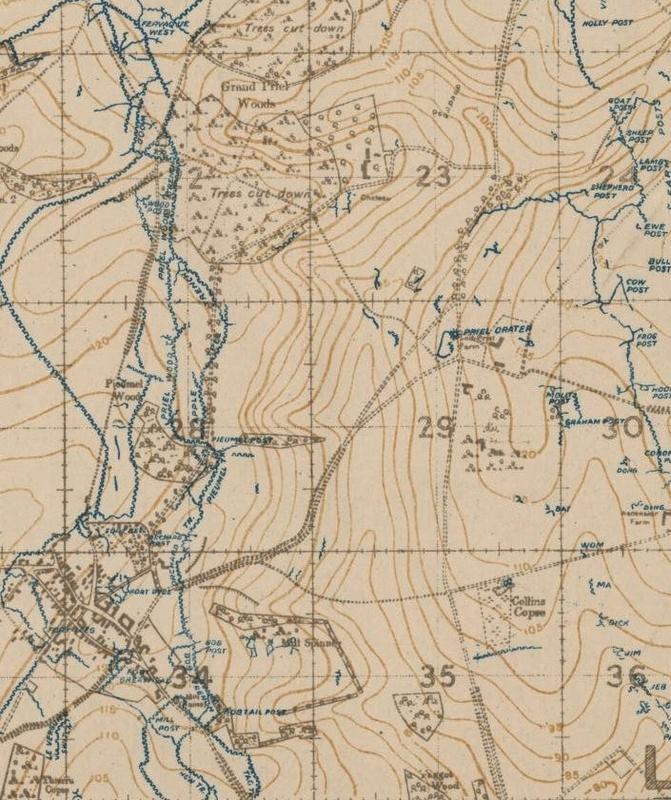 It requires more research, because I don’t know where the name Shepherd’s Copse first appears, but I would have thought it more likely that the action took place at Shepherd Post, as opposed to an unnamed (on the map) copse with no trenches marked within it, except a single small trench leading up the hill to Shepherd Post to the east – particularly as the citation uses the word ‘post’ more than once. 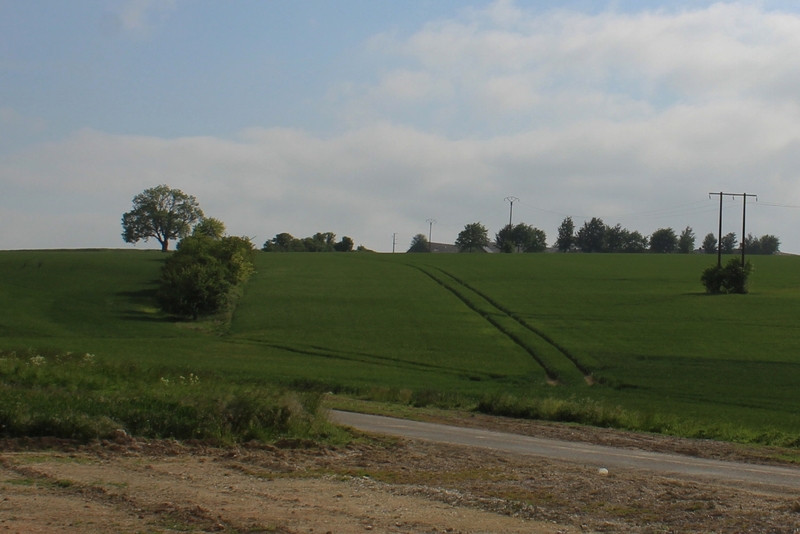 The six outposts served by Shepherd Post were up on the crest of the hill, Shepherd’s Copse now on the very far left. In the end Sayer and a handful of men, all wounded, were simply unable to fight any more and were captured; Sayer would lose a leg before dying in German captivity a month later, on 18th April. So what did Lance Corporal Sayer’s heroism achieve? 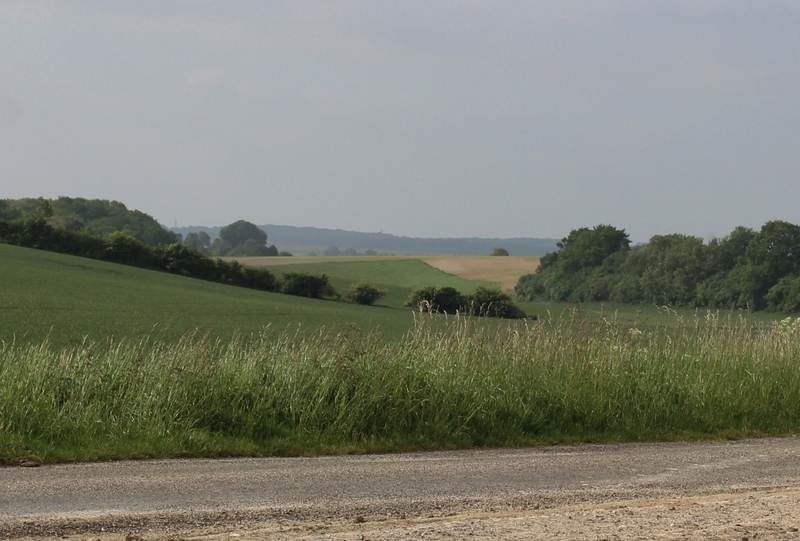 Although the Queen’s lost about seventy men in the fighting north of Le Verguier, including the twenty men who fought and died alongside Sayer, the Germans were forced to postpone their advance on the village until the following day, allowing the British defenders to withdraw without losing a single man. A letter written later in 1918 between the two men who recommended Sayer’s award, Colonel Hugh Chevalier Peirs, commanding 8th Bn. 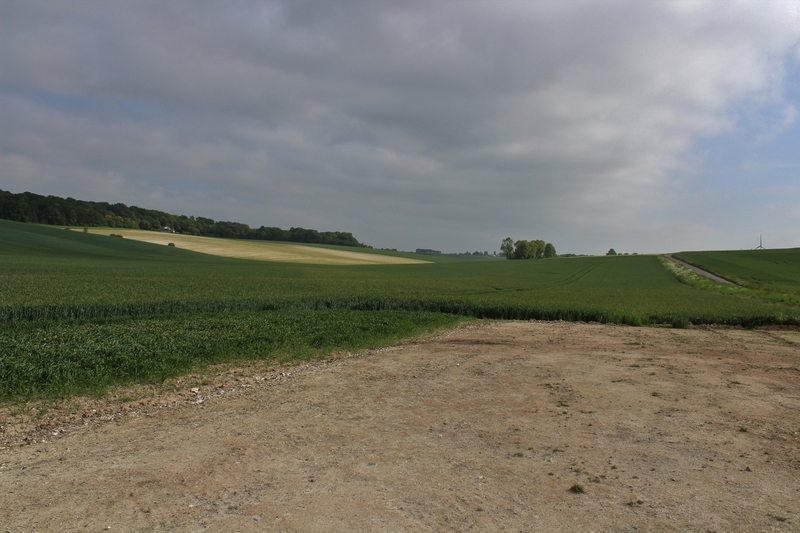 The Queen’s, and Lieutenant Claude Lorraine Piesse, has been uncovered in recent years which shows that, in Peirs’ opinion, Sayer’s stand was the key factor which enabled the battalion to hold out longer than any other unit on the entire British front on that March day. And yet John Sayer’s heroism at Shepherd’s Copse is virtually unknown today, for a variety of reasons, not least because his citation was not published until near the end of 1919, fifteen months after the event took place, by which time people were tired of tales of war heroes. Strangely, there is no mention of his exploits in the Regimental History, and very few of his papers, it seems, survive, one of those that does giving an incorrect date for the action at Shepherd’s Copse of 31st March, thus separating the action in which he gained his award from the award itself. 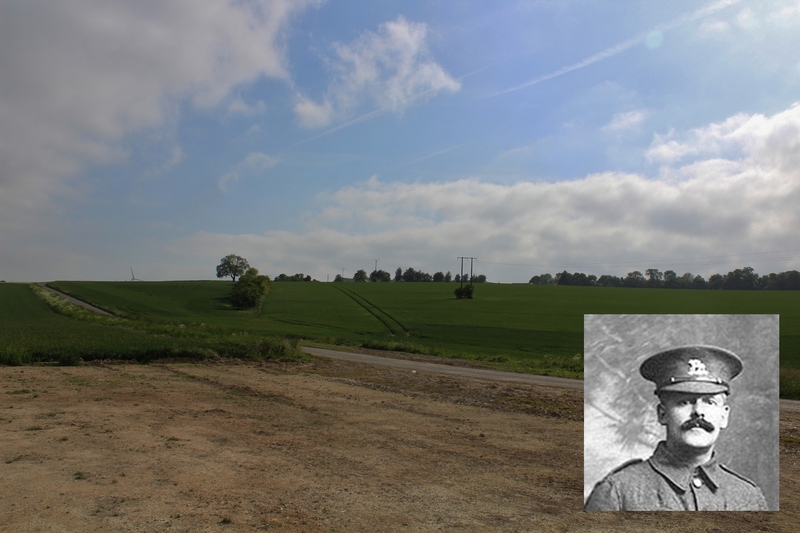 In recent times, research has uncovered more about the fighting here, and perhaps John Sayer will now be given the credit he deserves when the first day of the German spring offensive is discussed. *where R.C. Sherriff set Journey’s End. The advance continues, the men picking off German soldiers who had survived the barrage in their dugouts and now appear among the devastation. The author continues; “They seem to come from nowhere as if the earth were sick of them and disgorged them. They converge as they run, and then disappear. We know what this means, and our next business is to try and discover their hiding place. In a few minutes we come across it. It is cleverly concealed, and from the air it could not be seen. All the earth has been moved to a distance, and there is nothing to indicate its presence. We do not know whether it is a deep dugout or a shallow one. But that does not worry us. We can very quickly find this out. What we do know is that it is probably the place into which the Jerries have disappeared. So many men do not suddenly exist and then cease to exist. We gave the enemy credit for more common sense and fieldcraft. In an attack, a dugout is a suicidal hole. You cannot defend yourself, and the other man has you entirely at his mercy. To remain underground is to court disaster. We stand back from the mouth of the dugout, and shout out ‘Jerry!’. There is no reply. We call a second time. There is still no answer. We decide we cannot all be mistaken but we never think of going down to see if it is occupied. Instead, one of us takes out a hand grenade, and says that we shall soon know whether they are there or not. He pulls out the pin, counts two, and bends over the top of the hole. Then he hurls the bomb down. In three seconds it explodes. They are vicious things, and we hear the roar of the bomb as it bursts. This is accompanied by the screaming of the enemy. They realise that they are caught, and we hear them talking. They are like rats in a trap and there is no escape possible. The best they can hope for is captivity, and they cannot even be sure of that. We stand back in line, with our rifles ready. In each magazine there are fifteen rounds. We call to Jerry to come up. The talking down below is followed by silence. Then we hear footsteps as the first one comes up the steps. He emerges from the dugout with his arms above his head and his back towards us. When he has walked forward twelve paces, one of us aims and fires. He just drops in his tracks. The talking down below begins all over again. But we hold the whip hand, and we determine to get rid of the lot of them. We do not know how many there may be, but the number must be considerable, judging from the volume of sound that comes up. A second one comes out of the opening. He does exactly as the first man did. When he sees his companion, he utters a scream, as he knows that the same fate awaits him. We take it in turns to shoot. When the second shot is heard, they all know, without any doubt, that the end is near. Someone begins to whine, but we are merciless. For several days they have given us hell with their machine guns and their field guns. We have lost good men and good comrades. I don’t really have any words to follow that. This entry was posted in 1918 - The Advance East. Bookmark the permalink. This must’ve been a difficult installment to write. Great heroism on one hand, contrasted shortly later by the execution of prisoners, a lá Malmedy a generation later. It’s not often we hear of atrocities committed by the allied side – I bet it took courage to publish it. You have my thanks for doing so, and being so objective in your treatment of the story. God rest the souls of those who surrendered and were yet executed… it must’ve been a truly horrible way to depart this life, walking up those steps to certain death. And may God also have mercy on their executioners, who were doubtless filled with an irresistible thirst for vengeance on behalf of their recently-fallen comrades, and yet succumbed to the worst in human nature and allowed themselves to do such an terrible thing to fellow soldiers. This is one of those war stories that really chills me to the bone. What an awful thing it was, on both sides – it truly is hard to think about, much less dwell upon. Hello Andrew. 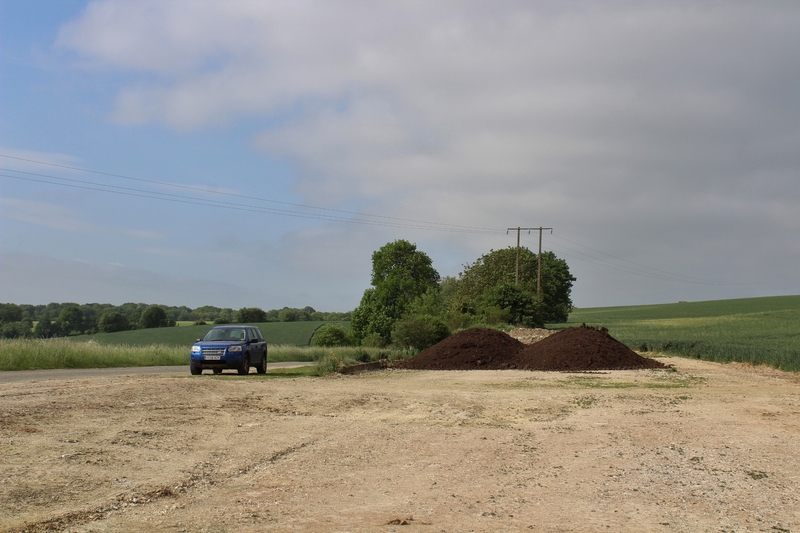 I started work on this post in June, working on the John Sayer story, which was why I visited the place, and it wasn’t until quite a bit later that I realised the close proximity of the Gloucesters’ episode (once read, never forgotten), and the two halves of the post came together quite quickly after that. You, I think, have read enough of my posts to know that every now and then something quite shocking – although this, I think, is as shocking as any – will come along, and I make no apologies for so doing. War is brutal and terrifying and personal, and every now and then I suppose I run the risk of offending sensibilities by reminding us all of that, but I shall continue to do so, as and when appropriate, and hopefully in a non-gratuitous fashion. Whether it took courage to publish is not for me to say, but I will say that posts like this have a different feel about them when I am writing them because I know they may be seen as controversial. Thanks for your personal thoughts on the men involved; your comments always add something to the posts they are attached to. And I do truly appreciate what you say in your second paragraph. I was at the Belgian Grand Prix in September, and the nearest village to the circuit? Malmedy. I am indeed an international man of mystery! And quite easily led off-topic if it’s a subject dear to my heart, such as Frank Zappa or motor racing, for example. Okay, first F1 race I attended was the Race of Champions at Brands Hatch in 1983, won by Keke Rosberg, then went to every GP in this country up to and including 1994 (winners I saw included Lauda, Prost, Piquet, Senna and of course our Nige and Damon), popped over to Monza in 2005, and then Spa this year (you can see I’m old school when it comes to circuits I want/need to visit). In the 80s I would probably be found at Brands maybe ten weekends across the year. My desktop currently features a photo I took of Daniel Ricciardo’s Red Bull cresting Eau Rouge. And did I get up at six a.m. for the Japanese GP last week? Of course I did! You “hooked me” MJS you International Man of Mystery – are you aware big smiling Daniel lives nearby me? (I don’t personally know him). He is our universal local hero and a genuine unassuming nice guy. Let’s hope his machinery unreliability takes a turn for the better with his 2019 move. I rely on you to personally record his journey with your camera. There, I’ve given you justification to spend more of your hard-earned … go to it! Me too . . went to school with James Hunt and knew him quite well. We kept in contact afterwards and used to meet at Brands Weds practice days when he was just starting in F5000 and I was racing an Aermacchi. I’m still an avid fan of F1 and motorcycle racing and go to the Island every couple of years. And before you ask, yes I do have a DVD of No Limit and a ‘Shuttleworth Snap’ T shirt! I think Andrew puts the response rather eloquently, I can understand how those men felt at the time and I suppose that had happened in reverse during the course of the war not that that excuses it but War makes different creatures of us. My thoughts go to how those men coped with there memories when the war was over and life returned to “normal “ you were right I was shocked by this post, although I’m glad you wrote it. I admire and am always in awe of the bravery of men like John Sayer. My great, great uncle from the AIF 14th Battalion was involved in the September 1918 attacks on the Hindenburg Outpost Line where he was awarded a Military Medal for ‘doings’ at Ascension Wood & Big Bill & Little Bill just outside of the maps in the blog. Another VC winner of note is AIF 13th Battalion Sergeant Gerald Sexton who captured machine guns & an artillery gun just out of Le Verquier however his real name was Maurice Buckley. He had to re-enlist in 1916 using a pseudonym for he was sent back to Australia from Egypt in 1915 due to venereal disease. Like you Daisy I am easy with reading factual reports on the killing of prisoners and indeed I feel its misplaced sentimentality to get strung out about what happened 100 years ago. How can we judge the extreme stress the participants on both sides were under having been enfiladed, bombed, shelled and gassed for day after day after day and seen their closest friends blown to pieces or left to die in agony in no man’s land? Your second para about Sgt Sexton (the clue might be in the name!) being posted back to Oz for contracting a social disease in Egypt had me rolling in the aisles – however, a very brave man and surely deserved his VC. Thankee kindly Daisy. Ascension Wood and the Bills are indeed only a couple of hundred yards beyond the ridge (last photo and others). And Sergeant Sexton is not the first Aussie mentioned on this site to be sent home from Egypt for that reason – and in so doing, in my opinion, both men were quite possibly saved from death at Gallipoli. Interestingly, bearing in mind you say that Sexton had to re-enlist, Cecil Wotton, the man whose original grave marker I found a couple of years back, took his medicine and was back in France the following year. Sexton was sent to a VD centre just outside Melbourne at Langwarrin, apparently a horrific place with abysmal conditions. After some weeks of treatment he simply walked out… the Army couldn’t find him & presumably struck him off their records. He was free to re-enlist… I guess if you endured Langwarrin & completed the treatment you could have been accepted back in the Army, particularly as the longer the war went on, the fewer numbers of men were available. Wotton may have followed the full VD program. The Kanimbla was first ship sent home from Egypt with almost 400 blokes with VD. Hey Sid, I had no idea that Danny R. was a local hero of yours. He’s a breath of fresh air. Mind you, I don’t think next season is going to be at all easy for him. Maybe the year after. Nigel, I’m not sure I’ve got over James’s death even now. One minute he was telling us once again what a rubbish driver Riccardo Patrese was, and the next he was gone. My next door neighbour also knew him pretty well and I believe her brother used to spend time with him at Brands in the 70s too. I have dumped a FF1600 at Paddock for my sins!! And you really have got a Shuttleworth Snap t-shirt, haven’t you? Love it! My son & I are also petrol heads but are becoming a bit bored with F1: Hamilton, Vettel, Hamilton, Vettel, Hamilton, Vettel, Hamilton, Hamilton, Hamilton,Hamilton… ho hum. More power to Daniel we say! Have tickets for the Australian Armistice Centenary Commemoration ceremony at Villers-Bretonneux & now making arrangements for the trip… looking forward to it although think it may be slightly colder than Bandung! Hahaha! Now, I do understand people getting bored with F1 but I guess that depends on the reason for watching in the first place. If you want wheel-to-wheel racing then touring cars or the junior formulae (or bikes!) are the ones for you. If you go back to the fifties and sixties (and occasionally later) you will find F1 races where the winner was a lap ahead of the second placed car, which we no longer get (safety cars etc), and in 1988 every race was won by one team (McLaren) and their two drivers (Senna & Prost) except Monza, and even there Senna was miles ahead before he was taken out by a back marker. More boring than today? Seeing the best driver in the best car (Hamilton at the moment, despite the fact I am a bit of a Ferrari fan – and the only person on the coach returning from Spa the other month who was happy that Ferrari had won – in all my GPs it’s the first time I’d seen a Ferrari win) winning is fine by me. I would make two changes to F1 – I have a colleague (one of the two guys who did the Riqueval Canal walk with me when all the others went to the pub) who runs the McLaren wind tunnel (really – he does) and he would remove nearly all the elements from the front wing – the bane of his life. Me, I’d make them change gears manually – so many races in days gone by were won by making your rival make a mistake, and the most usual mistake was to miss a gear. See, you lot have really got me going now! “Australian Formula One ace Daniel Ricciardo has taken time out of his busy schedule ahead of the Russian Grand Prix to passionately follow the AFL Grand Final between his beloved West Coast Eagles and the Collingwood Magpies. A goal to West Coast midfielder Dom Sheed with just two minutes left on the clock put the Eagles ahead by four points, ultimately sealing the match, and Ricciardo couldn’t contain his joy. He just comes across as a brilliant guy. And undoubtedly the best Aussie F1 driver since A.J. – and he was a hero of mine too, as he won the title in 1980 which was the first year I became interested, and also in my favourite car – the Williams FW07. I have never really supported a particular driver (my passion is this nearly 70 year project they call Formula One), although of course in the days of Mansell we all supported him, and I like to see the Brits do well (two new Brits in F1 in 2019 I’m pleased to say). There was one driver who touched (still touches) my soul from the very start, and sadly I never got to see him drive. He won only five GPs and he was the best of them all (in my opinion). Anyone???? Btw have just got back to Cornwall an hour ago, so will be checking all emails for the last fortnight later or tomorrow. With due reference to Sir Jack – about whom I had a wonderful book pre-flood – no. Alan Jones was World Champion in 1980 and between mid 79 and the end of 1981 he was simply the best. Oooh I am going greener by the second. Mind you we too would head to Silverstone quite frequently from Croydon in the 80s. You must have done indeed Sid. 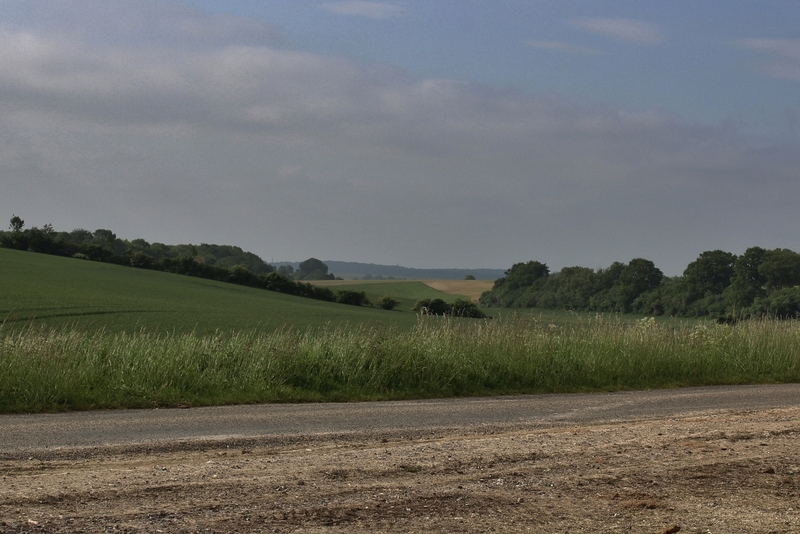 And the roads to Silverstone too! 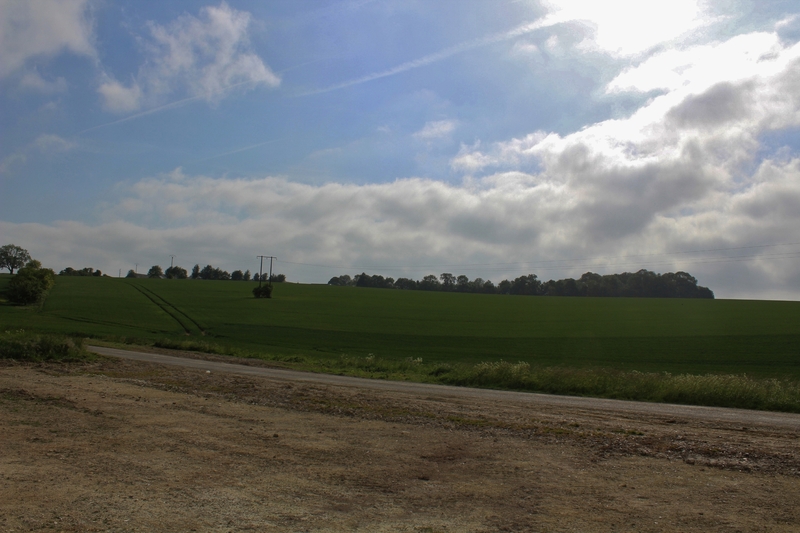 A year ago we visited Maissemy – the autumnal colours are a vivid memory as is the tractor driving by. A peaceful setting which belied what had happened not quite a century before. A photograph of Johann Kiessling drew me to his grave – he was born 24 October 1894 and died 15 September 1916. Shortly before was a first visit to the grave of my great uncle – killed by a sniper 03 October 1918. The author of the book was yet another casualty of war…..
Nice. Who is Johann Kiessling, ‘cos he certainly isn’t the well known German physicist, mathematician, and botanist, and which book, or am I being stoopid? I might well be as am currently post-migraine. Pah! I remember my family talking about Uncle John in the 1960’s and 1970’s…the last time someone I know went to visit his grave was my Great Aunt Sister Mary around 1978. I also remember the family talk a lot about how my own grandfather Albert “never came back to who he was before” from WW2. What a lot of folks dont know is as time and the family expands yes his story of his experience is being lost…a lack of acknowledgement all this time really means that history has been ours but almost lost. Another aspect is…”what of the family”…Ive a cousin who received bravery and valour in combat in Afghanistan in 2007 and I received a gold award from HRH Prince Edward in 1993, Im to understand, primarily for a search and rescue event I was in winter 1987 in Northern Alberta. Our society today is numb to so very much…the horrors experienced and to actually think a military or a royal award is “no big deal” or no one believes it. My thought is spent…take it for what you want of it. Hello Andy. Huge subjects to try to respond to. I think you’ll find that at least those who follow this website are duly respectful – all I can do is keep doing what I am doing. History is the domain of historians, and what we get is a historians view of the past. You will be pleased, I hope, to know that I ensured my own father’s WWII experiences won’t be forgotten by getting it all down in writing before he died a few years back. I appreciate your comments. Oh yes, I hadn’t forgotten. Actually, I had completely forgotten, hence the reason for your diary note! And I have only just made the Sayer connction!! Doh!